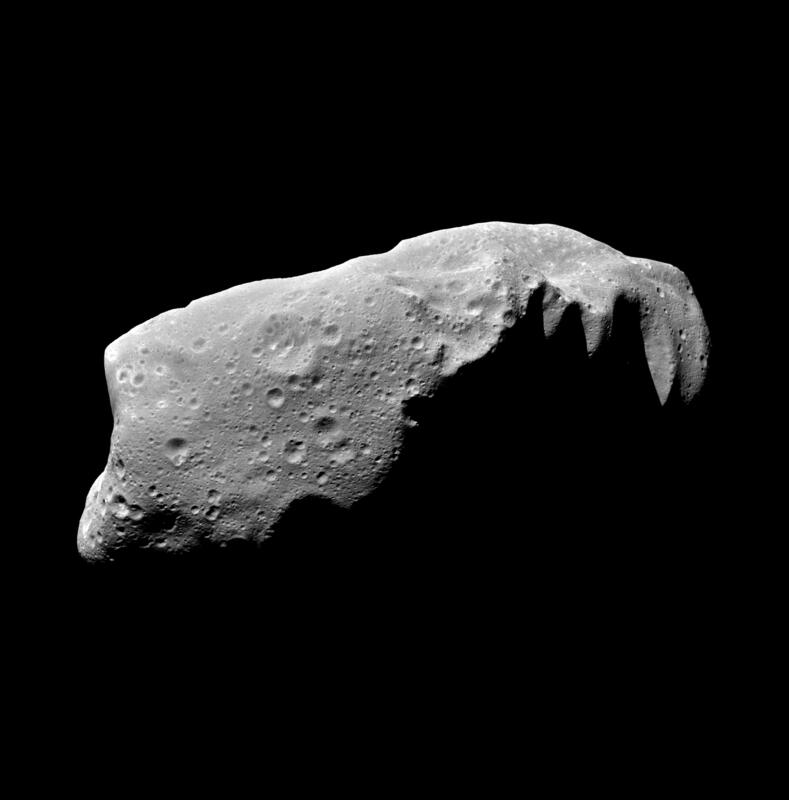 This view of the asteroid 243 Ida is a mosaic of five image frames acquired by the Galileo spacecraft's solid-state imaging system at ranges of 3,057 to 3,821 kilometers (1,900 to 2,375 miles) on August 28, 1993, about 3-1/2 minutes before the spacecraft made its closest approach to the asteroid. Galileo flew about 2,400 kilometers (1,500 miles) from Ida at a relative velocity of 12.4 km/sec (28,000 mph). Asteroid and spacecraft were 441 million kilometers (274 million miles) from the Sun. Ida is the second asteroid ever encountered by a spacecraft. It appears to be about 52 kilometers (32 miles) in length, more than twice as large as Gaspra, the first asteroid observed by Galileo in October 1991. 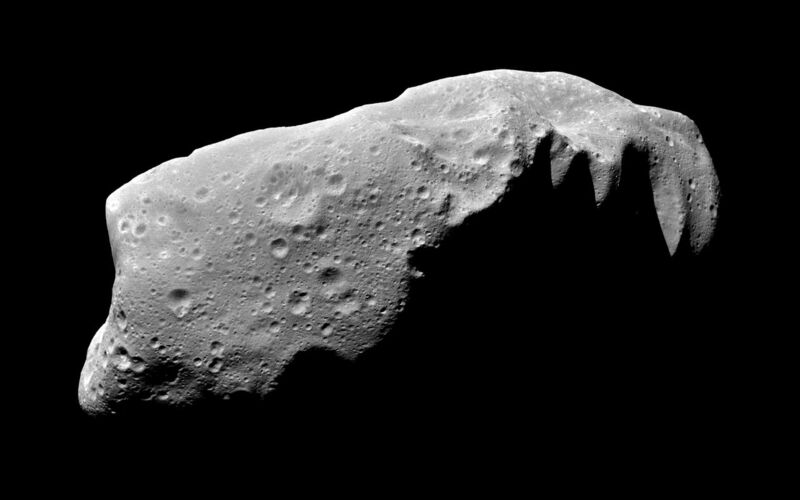 Ida is an irregularly shaped asteroid placed by scientists in the S class (believed to be like stony or stony iron meteorites). It is a member of the Koronis family, presumed fragments left from the breakup of a precursor asteroid in a catastrophic collision. This view shows numerous craters, including many degraded craters larger than any seen on Gaspra. The extensive cratering seems to dispel theories about Ida's surface being geologically youthful. This view also seems to rule out the idea that Ida is a double body. 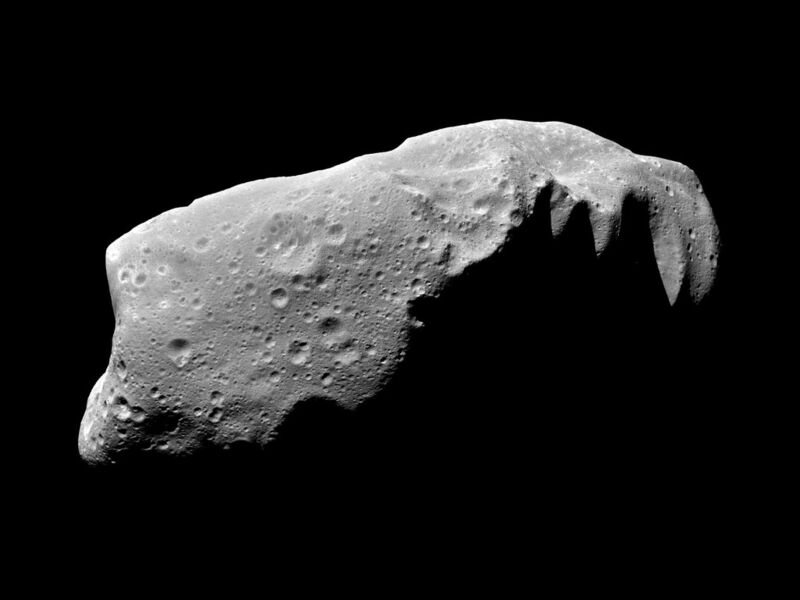 The south pole is believed to be in the darkside near the middle of the asteroid. The camera's clear filter was used to produce this extremely sharp picture. Spatial resolution is 31 to 38 meters (roughly 100 feet) per pixel. A 30-frame mosaic was taken to assure capturing Ida; its position was somewhat uncertain before the Galileo encounter. Galileo shuttered and recorded a total of 150 images in order to capture Ida 21 different times during a five hour period (about one rotation of the asteroid). Color filters were used at many of these times to allow reconstruction of color images. Playback to Earth of the remaining images is planned for April through June 1994. The Galileo project, whose primary mission is the exploration of the Jupiter system in 1995-97, is managed for NASA's Office of Space Science by the Jet Propulsion Laboratory.